Please refer to our stock # 1799 when inquiring. (A) Reticulated jade or jadeite double sided pendant plaque open work carved hard stone with an Asian man carved on both sides. 20 grams white to light soft sage with touches of light tan yellowish russet on some edges. Ice cold to touch, has a good gloss and a nice "clink" when clinked against an old nephrite carving. 57 X 40 X 4mm. 2 1/4" X 1 1/2" X 1/8" Possibly the older of the two pieces. Test: repeatedly used hard jewelers' metal tools and does Not scratch! 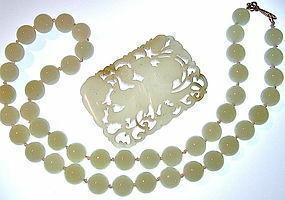 (B) Silk knotted highly glossy jade jadeite bead necklace. 64 grams - 45 beads - 10mm each and nicely matched. When held taut at eye level, very slight variation in color which is a very glossy light soft green. Ice cold to touch. Test: does Not scratch with repeated sharp metal tool attempts. From the home of an elderly widow whose husband served in the Pacific wars. The pendant shows more translucency than the beads. Both in very good pre owned antique and vintage condition. Please view all images, particularly #1 shown placed on light box as seen above and 3, 4 show both sides. The above are the best possible observations and descriptions. The shade of this most valued of hard stone has gone by many names: mutton, white, jade, jadeite, nephrite, etc. $17 Each USPS Priority/Ins/Track or Free with your USA Ck or USPS MO. Will mail to USA address only and accept USA funds only. International visitors please employ an American purchasing service or a friend / family member to make USA payments for you and to receive these in a lower 48 address. REPLY: Regrets - no international. Please have a USA buyer pay for this and receive this at their USA address.